With Odio WordPress Template you can display your tour dates, discography, videos, images and sell your band merchandise. The theme is to rock, share and deliver the latest information from the music world. Page builder allows you to create a homepage in just few clicks. Simply add and drag-and-drop elements on desired position. Displaying Tour Dates is a breeze with Odio thanks to the included Tour Dates post type. Just imagine music mp3 player which really easy to use with wonderful mix of classic & modern taste. 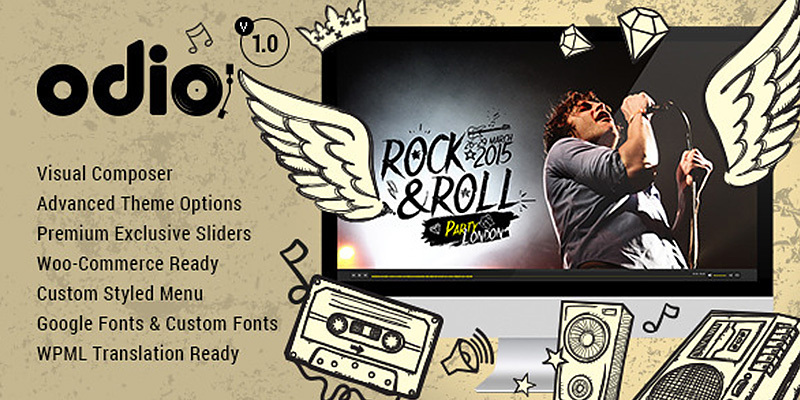 Vinyl styled music player is the perfect candidate for html5 music player on your website. Linear Music Player it’s a beautiful simple tiny player for bottom or top of your site. Find the best sizes and colors for yourself and embed it on the page right now. It works on tablets and personal computers. Odio is compatible with the Woo-Commerce plugin so that you can sell your band merchandise online. To make the website very easy to navigate we make sure that it was a clean one page design. Your visitors can learn more about all on the same page. Odio is ready to use from the box. Quickly install it via FTP or WordPress and after you activate it you can load demo content. Then you can add your own content on already designed pages. Custom Backgrounds feature allows you to set a custom background per page as well as set up a default background for all other pages/posts. This Theme Includes the amazing Master Slider. This plugin features tons of and easy to set options to create your own effects. Our themes are designed to work with any language utilizing .PO files. Just translate the included language file and you’re set. This theme comes with an extensive help file that explains how to set up every aspect of the theme. If you encounter any problems or just have a question after purchasing the theme head over to the dedicated support site. You get free support and updates in addition, for all our themes. The theme is tested in all major browsers. If you find an error, please contact us, we will correct the error and update the theme. –– Use our demo layout or create your own visually different experience using page builder and feature-rich backend. –– The theme comes with customizable menu options; you can set the menu on the left / right.